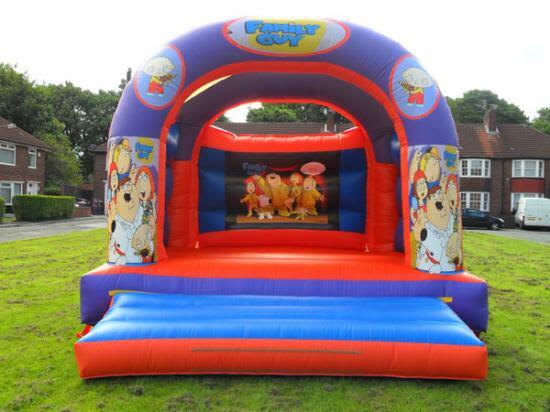 Family Guy Bouncy Castle Hire Wirral, Liverpool And Everton. Blow up the fun by hiring this Family Guy bouncy castle. Measuring at 15 x 15 x 16 feet, adults can take the stress off by bouncing like the kids. A space of at least 18 x 18 feet is needed to install this device, which is delivered complete with a rain cover. Overnight delivery is available for an additional fee of £15. This castle is clean, certified, checked and approved for quality. Any fans of Family Guy will especially approve as this castle features images of your favourite characters from the much-loved TV series that also is great for laughs. Jump with Stewie, Lois, Peter, Meg, Chris, Brian and more! Did you know that jumping and rebounding (landing) is wonderful for the lymphatic system, it stimulates white blood cell production and is excellent for the immune system? Think about that! Not only children stand to benefit! What better way to bring colleagues and staff together than to have a day of fun? What could be more ideal for your party? Your event will be one to remember! Excellent exercise combines with that free feeling that bouncy castles bring. You can count on us for service, delivery and price value. Call us, email or use our contact form if you have a query, or to book it now.